Every now and then I get a surprise in the mail. 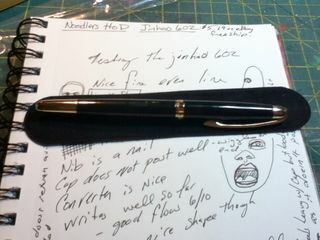 Today I got a Jinhao 602 fountain pen, a gift from Christie. She suggest I review it, so I'm being dutiful and doing so. Pulling the pen out of the envelope I found it in a black flocked case. It felt rather heavy for it's size. The black paint is smooth, the gold colored trim is nice, even if it's gold (I prefer silver.) the grip section is oddly trimmed in brushed steel. 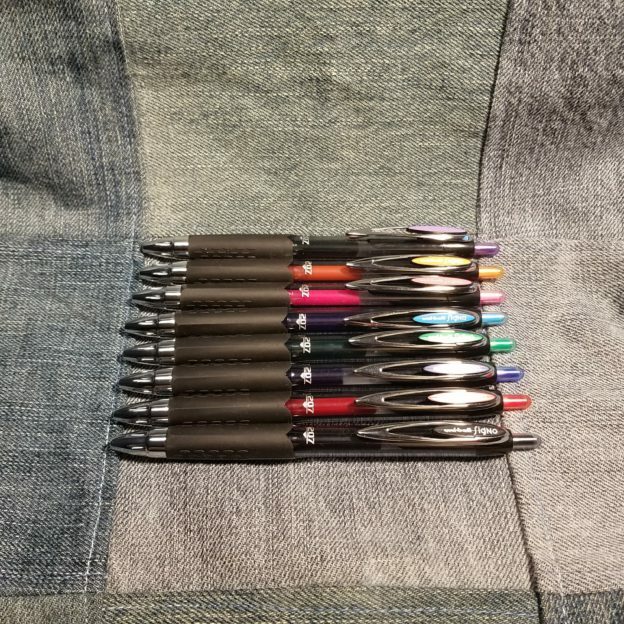 It doesn't match the rest of the pen, even if it is comfortable. 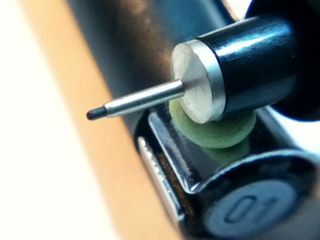 The pen is very slim measuring about 3/8th of an inch in diameter. It looks good. 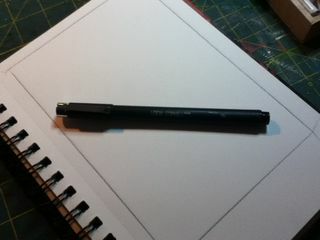 The downside is that the cap does not post well, as this is a small pen it would be more comfortable if it were posted. Overall this would be a very good pen for sketching, priced a little more than $5 you won't be heartbroken if it dies or you lose it. 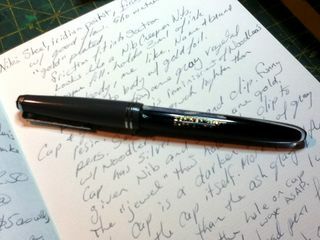 I was surprised at how well the pen wrote, it was remarkably smooth for $5. (Not as smooth as the Serwex Special I reviewed earlier.) Not a bad deal, head over to eB@y and search for one. Less than 1/2 inch in diameter. Cost: About $5.50 shipping included on eBay. 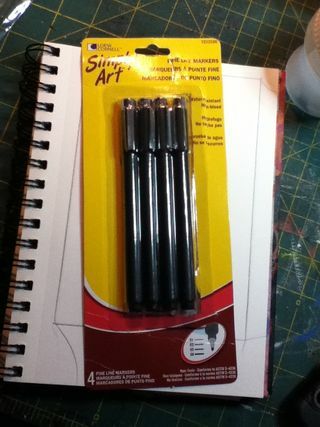 A good value for the money if you like thin pens with fine nibs. 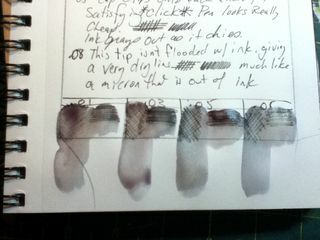 Unlike the Serwex Special I reviewed a few weeks back, this is not a candidate for abusing with India inks. 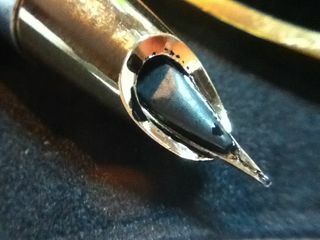 The hooded nib means getting the feed out of the grip for cleaning is nearly impossible. 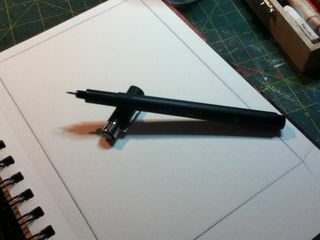 India ink will gunk up this pen and render it unusable in short order. 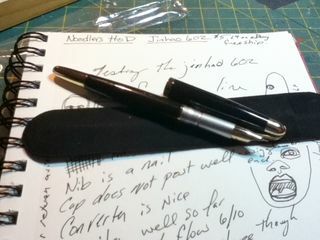 This entry was posted in Review and tagged doodle, fountain, fountain pen, ink, jinhao 601, pen, sketching on 20120128 by leslie. I stumbled upon Fountain Pen Revolution while searching for a place to find a couple of inexpensive fountain pens made in India. The FPR is a site dedicated to the sale of such pens. At the time I found his site I also found that he was running a special I took him up on his offer and scored a fountain pen for $2.50. The special is no longer running but his prices are pretty reasonable. 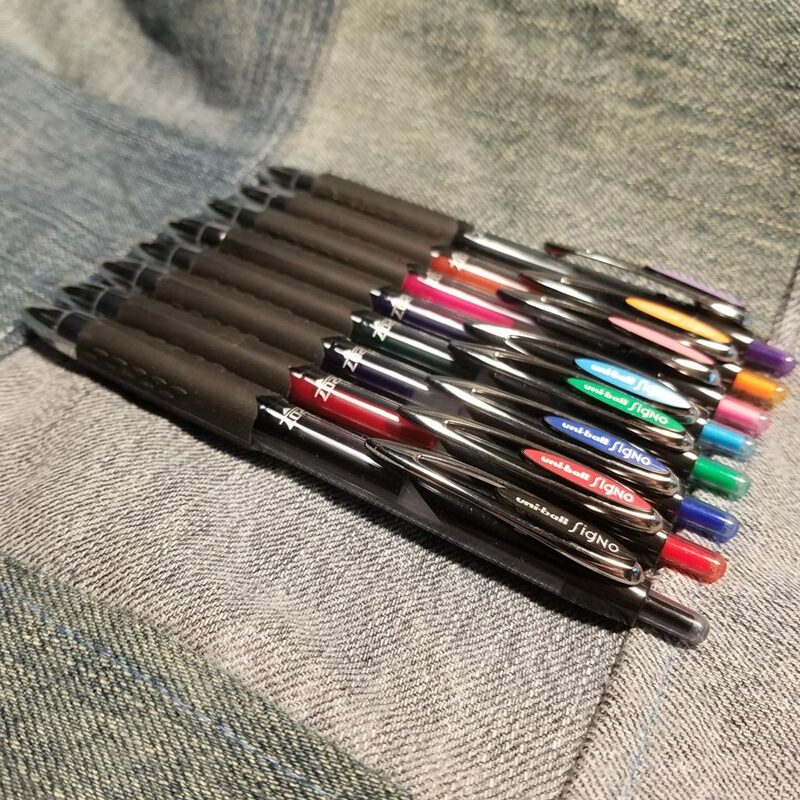 There are pens on his site for $6 plus $3 shipping. Not bad especially when you consider the review I'm going to give on this $2.50 pen. The pen I was sent was a gray Serwex Special 101. 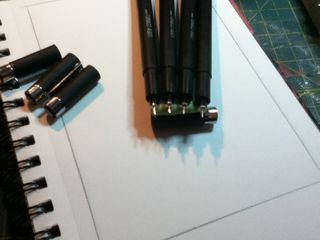 It reminds me of the Noodler's Nikita Nib Creeper pen. 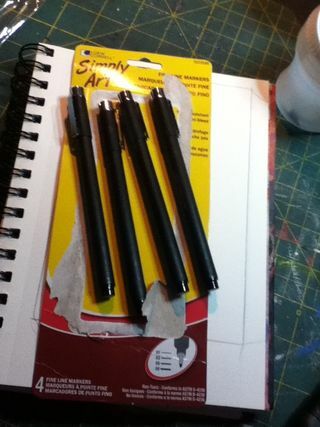 Ever since I got my first Noodler's pen I sniff my new pens, I know weird, but not. The Serwex has a slightly different odor like engine grease and garage, or what plastic toys smelled like in the early 80's,* somewhat pleasant. 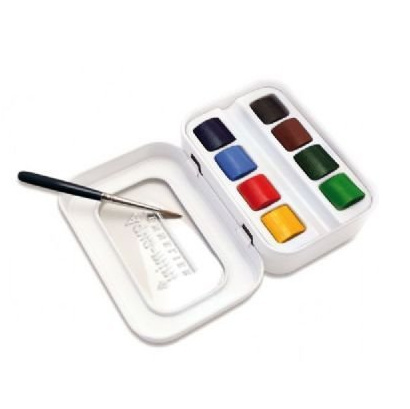 Unlike the Noodler's which I likened to dog crap and diesel fuel. Along the side of the clear barrel is a gold foil imprint of the company name and product name. The cap has 2 cap bands which are silver. The clip is also silver and seems to be pressed steel. The jewel, which holds the clip to the cap is black. The gray cap itself is slightly mottled with a few streaks of darker gray here and there. The barrel is tapered and has what I call a cigar shape, though small. Not the sexiest pen I've ever seen but looks serviceable and good knock around pen. Taking off the cap I'm greeted by a fine gold nib with a design and the words "iridium nib" pressed into it. 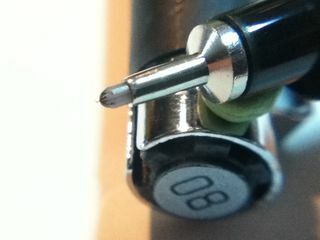 There is no breather hole in the nib. 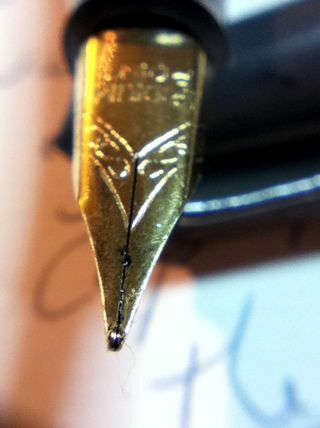 The nib reminds me of the Noodler's Nib Creeper nibs. ** I unscrewed the section from the barrel and found a few mould edges at the end, I scraped these off with an exacto, for fear they'd come loose with use. After rinsing the barrel and nib off I loaded it up with ink. For a smaller pen it holds an impressive 3+ml of ink. I loaded 2.5ml in it with a TON of room to spare. 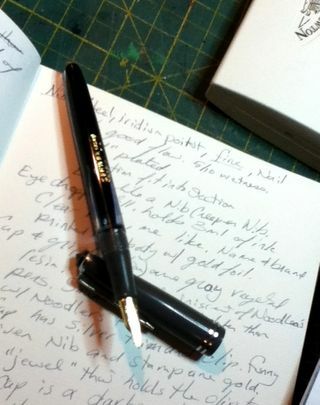 I loaded mine up, eye dropper style, with my sample of Iroshizuku Fuyu-syogun. 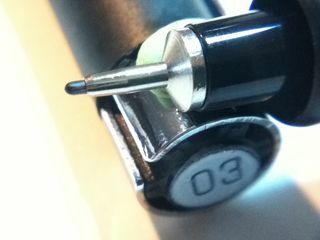 Yes, I put the most expensive ink I own into a $2.50 pen. Why? I'm addicted to gray inks right now and I had a nearly full sample of this ink and wanted to use it. 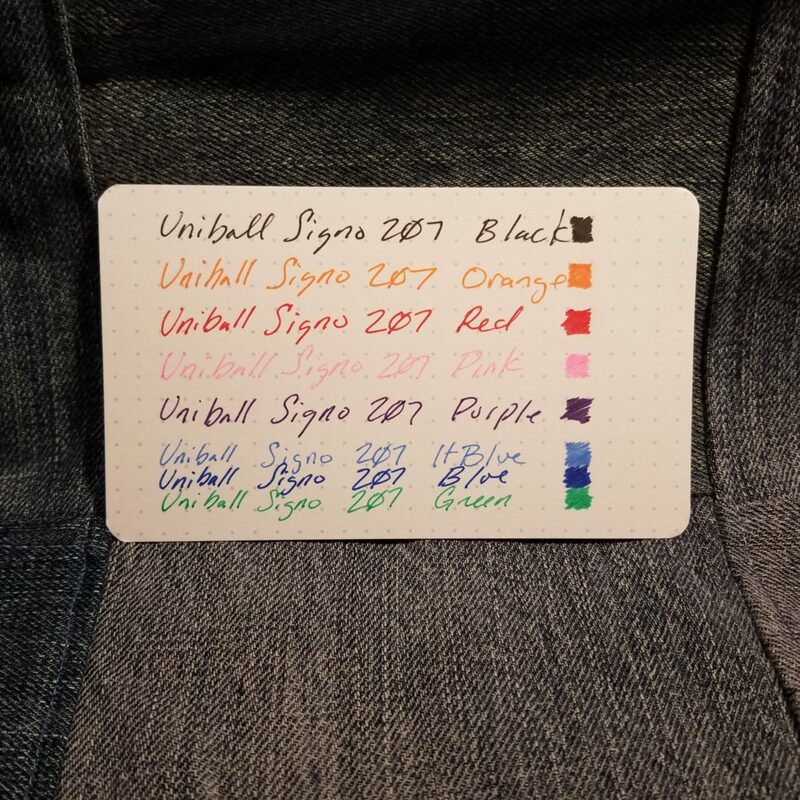 Plus, for the first time ever I had an ink that matched the color of the pen. Gray ink in a gray pen. I then proceeded to write out 2 full pages in my Exacompta journal. 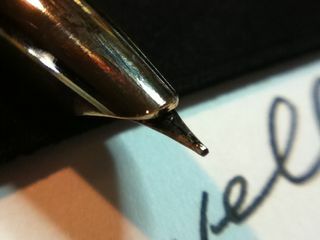 At first it was slightly scratchy, the feel of writing with this pen matched the feel of writing with a Noodler's Nib Creeper.The nib writes with a true fine and is rock hard, no bounce, no flex; it is friction fit into the section. It writes relatively wet and started up with a quick shake downward. 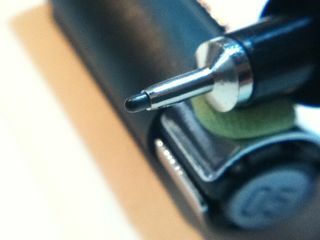 I did notice that when I had some ink on the nib it seemed to blob there. After I cleaned the ink off it no longer creeped to that one spot. At the end of the 2nd page of writing I noticed that the nib was much smoother than when I started. The flow of ink was perfect for me, slightly on the wet side (6/10) and the nib itself was smoother, and gliding over the paper. Given I was using a premium ink this was to be expected and I wonder what will happen when I put a less premium ink in it. All in all this is most likely to end up as my new gray ink sketching pen and will have a permanent spot in my drawing stable. Given my love of cheap pens I'm going to have to say I like this pen, a lot. Yes it's cheap and will never perform as well as a $50 TWSBI 540 and it has one nib size available- fine and it's construction is okay. The real thing to think of here is how it performs, and in my opinion if you are looking for something like a Noodler's Nib Creeper or an inexpensive pen this is a good pen. 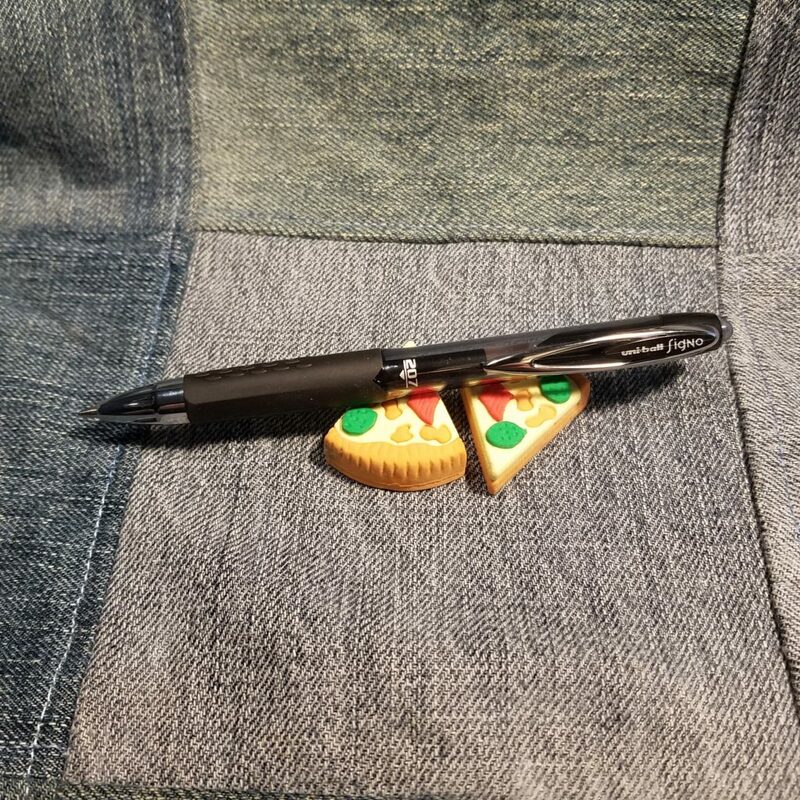 As an aside this pen is one you can COMPLETELY disassemble, meaning you can get at the innards to clean it… I have in the past abused fountain pens with India ink. This is a pen you could do that with as you can get at the feed and inside the section to scrub them with a toothbrush. Hmmm. Ideas. The Serwex Special 101 is not in stock at FPR. They have a pen called the Serwex 77TR that looks identical to this pen EXCEPT that the clip and bands appear to be all "gold" plated. At $6 plus $3 shipping it's not a bad deal, especially if the pens write as well as this one does. You can check out the FPR on FaceBook as well. 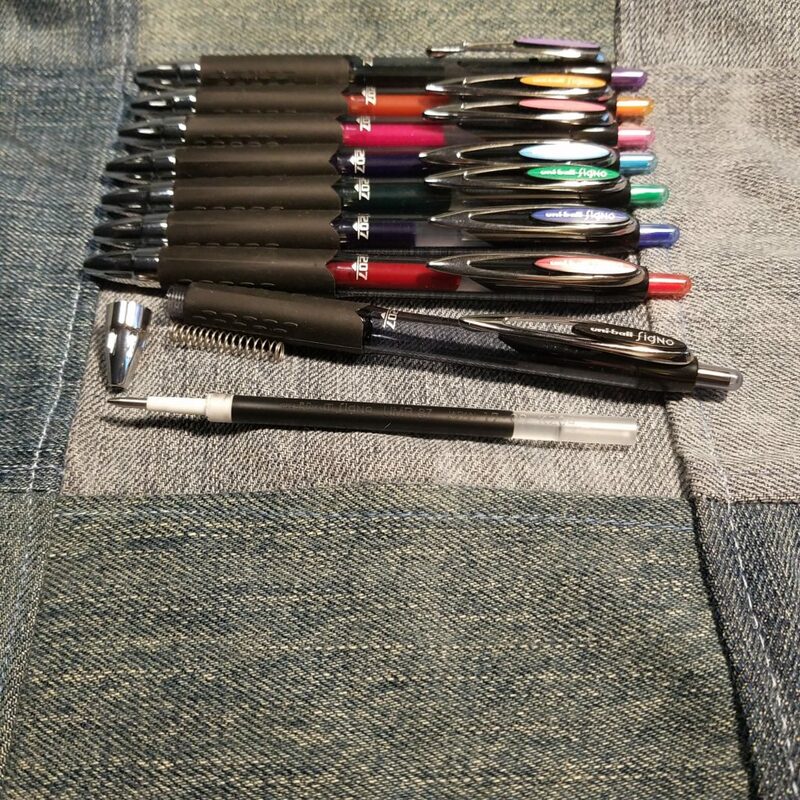 The way you order from FPR is to figure out what pens you want, make note of the name and color you want and send Kevin an email. He'll send you a total price. Then you paypal. Shipping is from India so it will take some time (3 weeks) to get to you, but the wait is worth it. 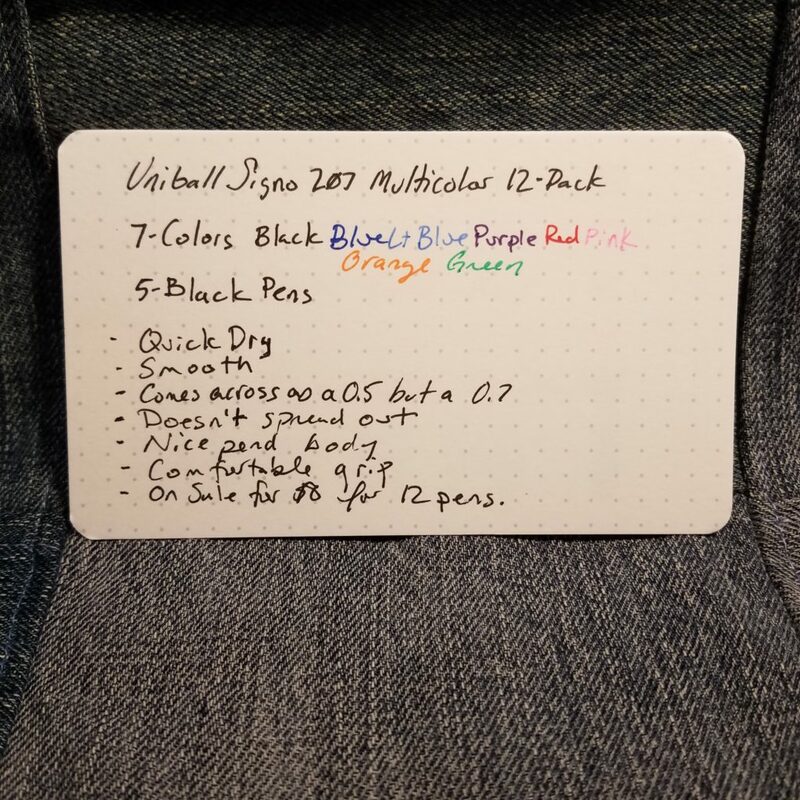 This entry was posted in Review and tagged cheap, fine nib, fountain pen, fountain pen revolution, fuyu-syogun, inexpensive, iroshizuku, noodler's nib creeper, serwex, sketching on 20120112 by leslie.